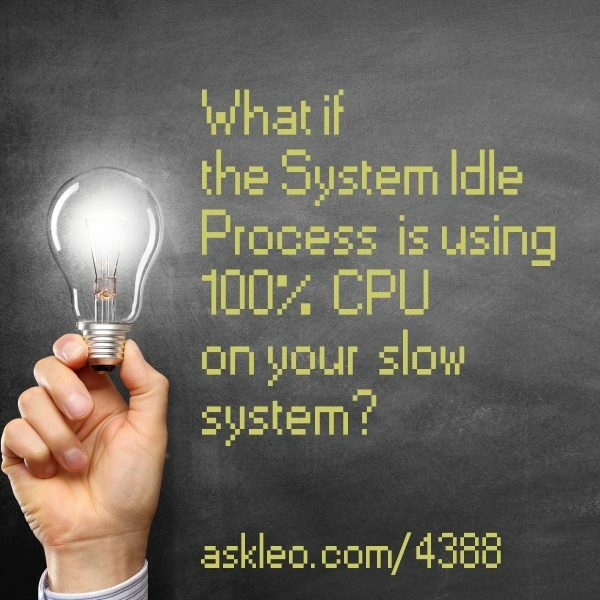 What if the System Idle Process is using 100% CPU on your slow system? - Ask Leo! What if the System Idle Process is using 100% CPU on your slow system? Why is My System Slow If the CPU Is Mostly Idle? - The purpose of the System Idle Process is to get out of the way to let other processes run. So what does it mean if the SIP is using 100% CPU on your slow system? What is the System Idle Process and why is it using most of the CPU? - Can a computer really do nothing? Yes and no. When it's doing nothing it has to do something, and that something is the System Idle Process. “Chkdsk Cannot Run Because the Volume Is in Use by another Process” — What Does It Mean and How Do I Fix It? - Chkdsk checks your disk for errors at a low level, requiring exclusive access to the disk to do so. "Chkdsk cannot run..." means it doesn't have the exclusive access it needs. Can I stop an “idle” computer from hitting the hard disk at all? - I'll show you how to reduce the last little bit of disk activity happening on your computer, but is that really going to help? « Previous post: Is it possible to bank online securely? Yes, if you’re careful.